Have you ever watched a pendulum swing? It swings way to the right, and then goes back to center. Then it swings way to the left, then returns to center again. In human nutrition, the sugar and starch pendulum appears to be returning to center. In equine nutrition, however, that sugar and starch pendulum seems to be hung up way off to the side. or grass in the horse’s diet as well as the concentrate (or grain-based) feeds. That is usually not what we want to do, because fiber is essential to maintain the health of the horse’s digestive tract. The sugars and starches are nonstructural carbohydrates or NSC (sometimes referred to as soluble carbohydrates). In some situations it may be beneficial to reduce the NSC in a horse’s diet. Are nonstructural carbohydrates “evil”? In the horse’s small intestine, most nonstructural carbs are broken down into glucose, a simple sugar. The glucose is then absorbed into the blood stream, and is carried to various tissues where it is used as fuel, or stored as glycogen (in the muscle or liver, where it later used as fuel) or as fat. Glucose is very important for the horse to function properly, as it is the only fuel that can be used by the brain, it is used to a large extent by the hooves, and it is the only substance that can be used for making glycogen. Studies have shown that horses that use up all their glycogen and are not provided glucose to replenish the glycogen stores show greatly reduced performance capabilities. So glucose is vital to the health and well-being of the horse. Again, glucose comes primarily from NSC. So, again, are nonstructural carbohydrates “evil”? We know that too much NSC (particularly starch) in a horse’s meal can cause problems. We want the NSC to be digested in the small intestine, but if we feed a large meal that contains so much starch that it overflows from the small intestine into the large intestine, it may cause digestive disturbances such as colic or laminitis. Studies have shown that feeding no more than about 0.5% of a horse’s bodyweight of grain in one meal will reduce the risk of grain overload into the horse’s hindgut, therefore reducing the risk of colic or laminitis. For laminitic horses (horses that have been previously been diagnosed with laminitis) feeding less NSC may be helpful in reducing the chance of a recurrence. Horses with chronic laminitis may be more susceptible and more sensitive to NSC in the diet. 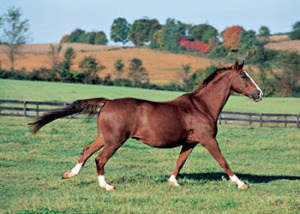 There are some horses that suffer from disorders such as Cushing’s Syndrome. This disorder may cause a problem in the regulation and use of glucose in the body. The hormone insulin helps regulate glucose, by causing it to be removed from the blood into the tissues where it is used or stored. In horses that suffer from Cushing’s Syndrome, the insulin may not function properly to regulate the glucose, and we see high levels of glucose in the blood. We call these horses “insulin resistant”. In these situations, it may be beneficial to feed less NSC so that there will be less glucose provided by the diet. Another situation in which low NSC diets are recommended is for horses diagnosed with “Equine Metabolic Syndrome”. These horses are usually obese, and blood tests show them to be apparently “insulin resistant”. However, in many cases if the horses are put on low calorie diets and lose weight, their glucose and insulin values return to normal. all the essential nutrients to meet the horse’s nutritional needs without exacerbating any medical conditions. For most typical horses, the amount of NSC in a standard diet of grass or hay and concentrate feed will cause no problems. In situations where the NSC may be an issue, there are factors to consider other than just how much grain is in the horse’s diet. Horse owners almost always look at the grain portion of their horse’s diet to reduce the NSC. However, just because a feed contains grains, it does not mean that the feed is high in NSC. Conversely, just because a feed does not contain whole grains does not mean that it is low in NSC. Different ingredients in a feed contain different amounts of nonstructural carbohydrates, and it is the total mixture of ingredients that determines the NSC content of that feed. Purina Mills has several feeds available that are low in NSC. And more importantly, those feeds are formulated to contain all the nutrients necessary to meet the horse’s nutritional needs. Further, we need to keep in mind that fresh grasses and some hays can contain fairly substantial amounts of NSC. When dealing with a horse that is suffering from a disorder that may be aggravated by high levels of NSC, it is vital to look at the forage portion of the ration as well as the concentrate to determine the best total diet for that horse. Finally, it is essential to keep in mind that each horse is an individual with individual needs. When we start looking at individuals with special needs such as those with Cushing’s Syndrome, or obese horses, or laminitic horses, there is no cookie cutter approach to meeting the horse’s nutritional needs as well as the medical needs. At Purina Mills, we have a large variety of feeds available to meet the needs of horses in many different situations. We have a number of equine nutritionists and veterinarians involved in current research to determine the best blends of all ingredients and nutrients to provide the safest and most effective ways to feed horses. Our goal is to provide the best nutrition for your horse by supplying the nutrients necessary to support your horse’s health, performance, and longevity. This entry was posted on Tuesday, March 27th, 2012 at 2:01 am	and is filed under Articles, Horse. You can follow any responses to this entry through the RSS 2.0 feed. Both comments and pings are currently closed.